Your daily dose of color! 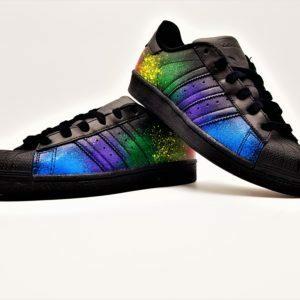 The adidas color splash is the pair of custom shoes to have in her wardrobe! 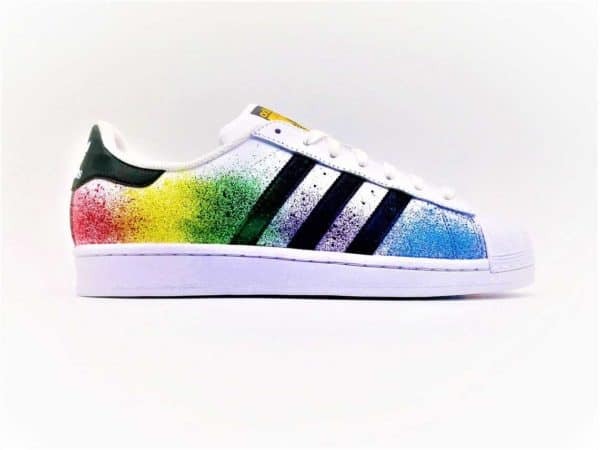 Made from the iconic superstar of adidas, this model is made with splashes of paintings in the colors of the Rainbow. 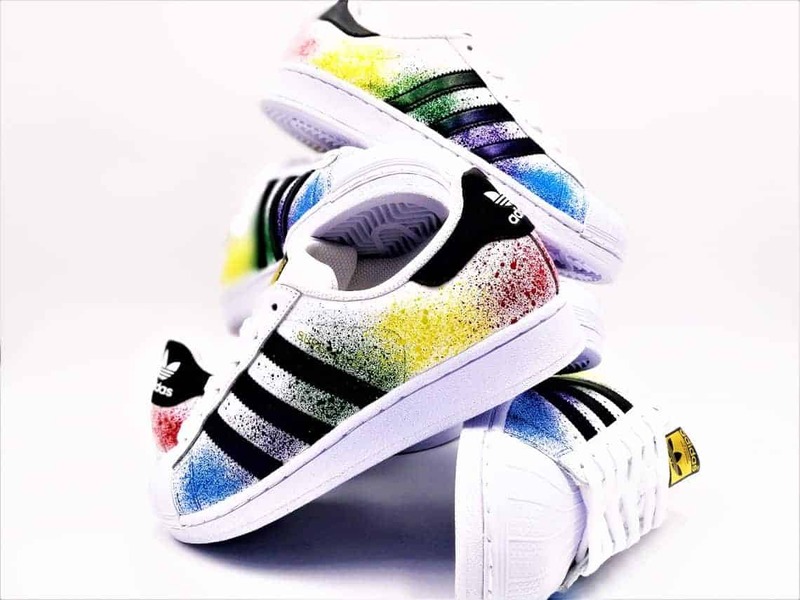 An icon of a whole generation, the adidas Superstar are revisited by double G customs in this version color splash! This pair will bring a touch of originality to all your outfits. 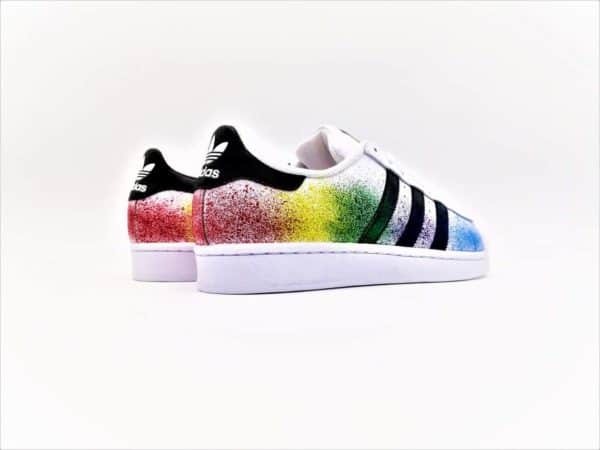 The adidas color splash are made with splashes of paints of different colors. Also available in other versions: the Adidas color splash superstar Black Edition and the Adidas color splash Stan Smith. Double G Customs is the encounter of two passions, shoes and art. It is the fusion of these two worlds that gave birth to this concept of custom footwear. We work on all types and models of footwear to offer you a unique customized piece tailored to your desires. We use professional products specially developed for the customization of shoes. 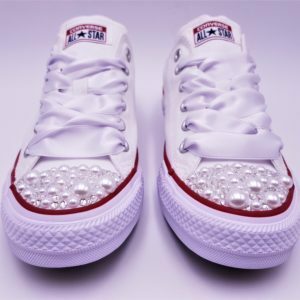 We make it a point of honor that our custom shoes are 100% portable like classic shoes. 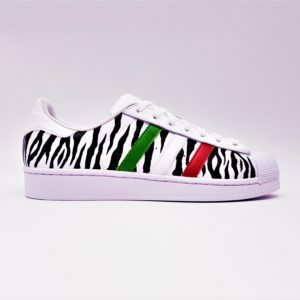 Since 2015, we are constantly pushing the limits of customization by developing new techniques, to offer you customized shoes that are always more innovative and close to your expectations. Discover the different possibilities for customizing shoes and other media in the tab TAILOR MADE. And to allow you to keep your shoes customized in perfect condition, discover our range of protection and cleaning products for sneakers. The life style collection is made up of customized shoe designs for everyday life. The life style models of double G customs are designed to be worn every day and give a touch of originality to your outfits. 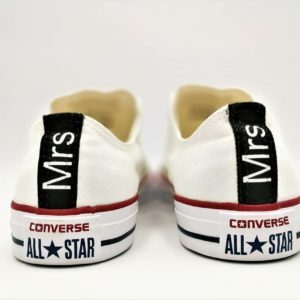 Assert your style with our customized shoe models. The adidas Superstar, a must-have model of the brand, was launched in 1969, but its design starts 10 years earlier. In fact, at that time, the son of Adi Dassler (founder of the brand), Horst took over the management of the first adidas factory in France (in Dettwiller in Alsace). Totally against the vision of his father, Horst decides to open up to the tennis market, hence the birth of the famous Stan Smith who is none other than the big sister of the superstar. 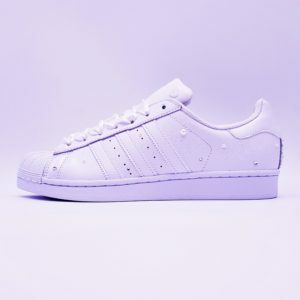 In 1968, adidas already established in the United States, decides to embark on the basketball market by modifying its iconic Stan Smith and adding the famous three bands and a new sole. A low model called "Supergrip" and a high model dubbed "pro model" are the day. Anxious to improve his model, adidas then added the famous Rubber toe to the front of the shoes that at the base, was nothing aesthetic, but allowed the tennis player not to damage their shoes by serving. At first, the NBA teams finally adopted this new basketball shoe. 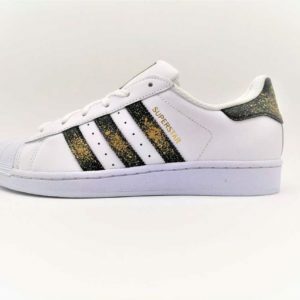 It was only in 1969 that the two models were renamed "Superstar" when the Boston Celtics won the NBA title with the famous adidas shoes on their feet. The model until then was not unanimous, but once worn by the "best basketball players in the world", the success was dazzling! 4 years later, in 1973, 85% of NBA days played with superstar, legend was on! His success in the NBA lasted until 1979, so the superstar had to find another audience. The superstar found a second life thanks to the then nasted hip-hop culture and especially thanks to the "Run DMC" which became the first group of music sponsored by a brand. The superstar's success continued until the early 90 years before falling into oblivion. It was only in 2015 that adidas decided to get out of the closet his superstar by launching a limited edition wave in collaboration with personalities like pharell Williams and David Beckham which gave a new breath to this mythical model originally conceived for the practice of basketball. There is no opinion yet. This site uses Akismet to reduce unwanted. Learn more about how your feedback data is used. By subscribing to the newsletter, you agree to the terms and conditions. You can unsubscribe whenever you want. Shoes received in advance despite a very short delay. Answer any questions. Excellent customer contact and quality at the top!